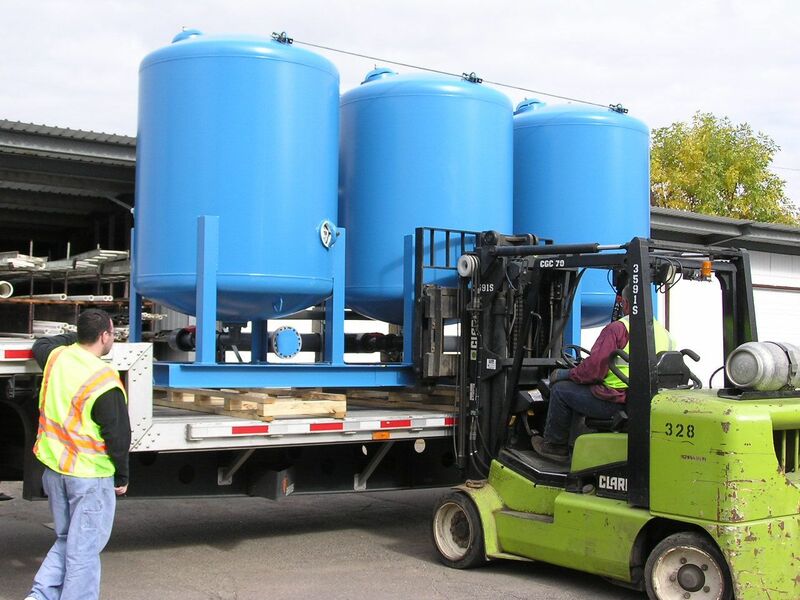 Industrial Water Softeners and Custom Systems - Robert B. Hill Co.
We design our industrial water softener systems to meet your exact specifications. Available options include skid mounting, explosion-proof wiring and control panels, water or pneumatic actuated control valves, brine pumps, piping in several different materials, PLC control panels, and custom steel tank designs for maximum longevity. We work closely with you to ensure that you have the perfect water softener system for your application. We skid mount industrial water softeners and all piping, wiring, and control valves are pre-installed to save time during on-site installation. We factory test all functions to ensure that your custom system is ready for immediate installation on delivery. Our factory testing procedures include pressure testing of all piping, cycle testing of all valves, operational simulation with the system control panel, and more. 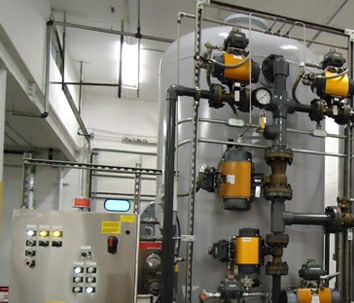 Robert B. Hill Co. designs water softeners that include explosion-proof wiring and control panels. Explosion-proof wiring requires specialized conduit, sealant materials, and condensation drains. Our explosion-proof panels utilize a Z-purge. Your softener will remain functional even under adverse conditions. Many factors must be taken into account during the design of an industrial water softener system. The first issue to look at is the application: what is the system going to be used for? Industrial water treatment systems can be used in a wide variety of applications and industries: refineries, power plants, food processing, hospitals, cooling towers, boiler feed, and hotels for example. The second variable in the design process is figuring out the daily demand on the system. This is calculated in gallons per minute (GPM), gallons per day (GPD), and the influent water quality. The vessel size, pipe size, and control valve sizes are all dictated by the daily demand. A good rule of thumb is that each vessel does not regenerate more than once per day. The bed velocities need to be at an acceptable rate to minimize pressure loss and increase bed longevity. Bed velocities can range from being extremely conservative to extremely aggressive. Most designs call for bed velocities of 8 to 12 gallons per minute per square foot of bed surface area. To make sure that a vessel does not regenerate more than once per day, an analysis of the influent water is critical. The water hardness and salt dosage is what determines the capacity of a cubic foot of cation resin. Water hardness consists of calcium and magnesium, which is measured in parts per million (PPM) or grains per gallon (GPG). To calculate the capacity of a water softener, you will need to figure salt dosage, water hardness, and the number of cubic feet of resin per vessel. Salt dosage of 10 lbs. per cubic foot equals 25,000 grains. 25,000 grains x 100 cubic feet of resin=2,500,000 total grains divided by hardness in grains per gallon (30) GPG=83,333 gallon capacity. The above example means that with 100 cubic feet of resin per vessel at a hardness level of 30 GPG, the capacity per vessel would be 83,333 gallons before the Industrial Water Softener would need to regenerate. At a 10 lbs. salt dosage per cubic foot of resin, the vessel would use 1,000 lbs. of salt for every 83,333 gallons of water that was softened. When designing the Industrial Water Softener System, pressure loss must be carefully considered. The variables that impact system pressure loss are resin bed depth, bed surface area, size/type of control valves, pressure vessel internals, and pipe size. The deeper the resin bed, the more pressure loss the system will have. This is also the same for the bed velocity. Higher bed velocities lead to an increase in pressure loss. Typical design calls for no more than a 1 psi drop across the service control valves. The valves are rated for a certain flow rate at a 1 psi drop. This is called Cv and must be calculated in all design work. Below are charts of various control valves and their Cv. We consider pressure loss of more than 15 psi across the entire system to be unacceptable. Our control valves can be designed to accommodate any application. Aquamatic diaphragm valves are the most cost effective option, using air or water to control the opening and closing of the system’s valves. Depending on the control valves’ manufacturer and materials of construction, these valves can be rated for over a million cycles. The AquaMatic K52 Series valve provides the time proven advantages of the Y pattern design for pipe sizes from one-half inch to three inches. The body and cap are molded in strong, glass-filled Noryl, and the diaphragm is made of durable Buna N or Viton materials. Various pipe end connections are available for your system design. Other AquaMatic valve options include spring-assist open, spring-assist close, flow control limit stop, poppet position indicator, Viton seals, butyl seals, normally closed, and fail-safe spring closed products. The AquaMatic K53 Series valve is designed for controlling the flow of most fluids including deionized water, salt solutions, and corrosive fluids such as acids and caustics. The rugged construction employs strong corrosion-resistant glass-filled Noryl components. The Y pattern design permits high flow with low pressure drop. Separate flow and control chambers provide positive closing without springs. Dual O ring design on the shaft prevents leakage between the flow and control chambers, and the cap is easily removed for maintenance purposes. True union end design with female socket weld connections provide easy installation and servicing. The AquaMatic V42 Series valves are constructed of cast iron and are designed for air and water applications. A separate control chamber protects the diaphragm from line fluid and extends life cycle. Reinforced diaphragm of Buna N or Viton materials are pre-formed and stress relieved to maximize responsiveness and product life. The valve is highly serviceable even while in line. A variety of options are available such as spring-assist open, spring-assist closed, flow control limit stop, normally closed, poppet position indicator, and high temperature EP Viton seals. The AquaMatic V82 Series valves are constructed of brass and are identical in operation to the V42 Series. Body and cap are brass, and components are designed to withstand up to 250 psi (17 bar). The AquaMatic V46 valves are constructed of 316 Stainless Steel. They are available in 1 inch, 1-1/2 inch and 2 inch sizes, in either threaded or flanged ends. Flanged ends are rated for 150 psi (10 bar) and threaded ends are rated for 250 psi (17 bar). When Ball Valves are used as control valves, the Cv is much greater than the above AquaMatic diaphragm valves. One drawback to using ball valves is that they are much more expensive than diaphragm valves and butterfly valves. Some example of ball valve manufacturers we can use in our systems are AT Controls, Fairchild, Jordan, KF Industries, Masoneilan, McCanna, QTRCO, Richter, Sharpe, Sinclair-Collins, SVF, TBV, Triac, Tuchenhagen, Worcester. Below is a Cv chart for typical ball valves. More complex valves consist of multiple metals such as stainless steel, carbon steel, and alloys. These valves typically have a valve, a pneumatic actuator, and a position indicator. The valves are commonly ball valves or butterfly valves. The benefit of using ball valves is a much higher flow rate with a lower Cv compared to a butterfly valve. Depending on materials and the manufacturer of the control valve, they can be rated for over one million cycles. Air actuated valves can be fed from a variety of materials, but ridged stainless steel headers and tubing are used in most applications. Robert B. Hill Co.’s industrial water softeners can be manufactured with nearly any type of piping material, including welded stainless steel, carbon steel, alloys, copper, PVC, CPVC, and others. The control panel is a critical part of any industrial water softener. Our panels can operate independently or be designed to function as part of a plant’s existing system so the water softener can be controlled and monitored at the unit or from a remote location. Our control panels can be custom-designed to meet your needs. Alarms, indicator lights, failure position modes, and numerous other options are available. Two common applications for Industrial Water Softeners are boiler feeds and cooling towers. Boiler feeds typically consist of alternating water softeners to allow a continuous feed of soft water. Because of boiler efficiency, capacity -- and not flow rate -- is the main issue in designing the water softener system. The higher the operating pressure of the boiler, the more stringent the water quality requirements will be. In cooling towers, an industrial water softener removes calcium and magnesium from the make-up water, or is incorporated to continuously soften a portion of the water as a side-stream system. This can eliminate (or at least manage) the amount of calcium and magnesium in the tower bulk water, reducing the scaling potential of calcium and magnesium related deposits. A high-quality custom water softener quickly pays for itself in either of these applications by reducing energy consumption, extending the life of system components and lowering repair costs. 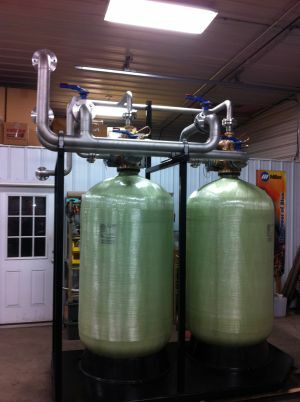 Robert B. Hill Co. can build an industrial water softener system to match your exact requirements.